Would a flat Earth suffer from climate change? Flat Earthism and the idea that human activity is not responsible for climate change are two of the most prevalent conspiracy theories today. Both have been increasing in popularity since the late 20th century. Currently, 16% of the US population say they doubt the scientifically established shape of the Earth, while 40% think that human-induced climate change is a hoax. But proponents of one of these theories are not necessarily proponents of the other, even though both are often motivated by a common mistrust of authority. In fact, they regularly contradict one another. 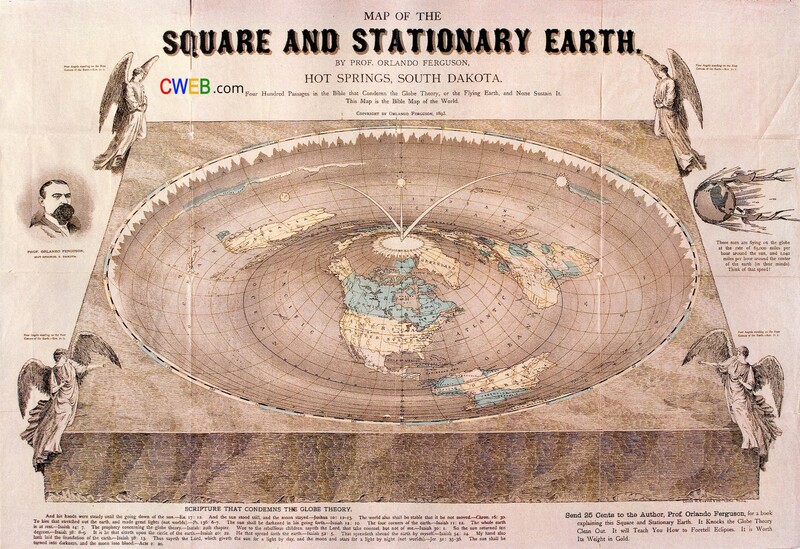 Flat Earthers, for example, tend to disbelieve organisations such as NASA on the shape of Antarctica – or indeed, that there is a southern hemisphere at all. Yet the president of the Flat Earth Society, Daniel Shenton, is quite convinced – presumably at least in part thanks to information from NASA – that climate change is happening and espouses a fairly conventional view on the subject. Such selective reasoning is common among conspiracy theorists who often lack consistency with one other. Despite this, the media, celebrities and even politicians regularly make broad comparisons between climate change scepticism, Flat Earthism and other conspiracy theories. In the field of global climate change, scientific bodies often are accused, even by those in power, of fabricating data. But such criticism is often deeply flawed. Take those sceptics, for example, who believe that climate change is occurring, but because of natural – rather than man-made – causes. If one argues that data has been fabricated to show warming where there is none, one cannot then also imply that warming is occurring after all, but naturally. Either there is warming or there is not. Similarly, Flat Earthers who state that images showing Earth’s curvature are due to the shape of a camera lens, themselves believe in a disc which by definition has a curved edge. Climate change is a process which has been ongoing since (the) beginning of detectable history, but there seems to be a definite correlation between the recent increase in worldwide temperatures and man’s entry into the industrial age. In this instance, the president of the Flat Earth Society is correct. Anthropogenic climate change sceptics, on the other hand, are often willing to accept the science behind the Earth’s natural cycles, which they blame – instead of human activity – for the world’s weather woes. Clearly, we again find an implicit difference of opinion between a Flat Earth model, and a non-anthropogenic climate change one. Climate change: a ‘global’ problem. It is also clear that many climate change sceptics believe in the (approximately) spherical Earth, even if only subconsciously, by their use of scientifically accepted global maps when discussing data – not to mention when calling it “global” warming. If governments and scientists are so untrustworthy and steeped in corruption, then why would one believe them on any issue? Where does the line of trust actually fall? Why would a person who mistrusts governments and scientists on the shape of the Earth, not hold the same politicians and scientific organisations similarly bogus on the issue of climate change? Or alien abductions, chem trails, or anything else? But the problem isn’t likely to go away any time soon. The US has the highest number of believers in both flat-Earthism and anthropogenic climate change scepticism, and the UK is not far behind. The US also has a high number (more than 50%) of senior political figures who deny man-made climate change, not to mention a democratically elected leader vocally believing the same. There are also numerous well-known celebrities who question the established shape of our planet. Scientists, by necessity, have to communicate their findings in a certain rigid way focusing on probabilities, certainty values and confidence intervals. These can appear dry or baffling to the public. But by providing more easily understandable narratives we can make scientific discussions with the public more productive. In today’s complex world of social media narratives, the engagement of scientists with the public is more crucial than ever. Thankfully, current funding for public engagement training and activities is accessible to scientists with a passion for communication and conversation, enabling them to communicate facts rather than “fake news”.